Nemu “destroys” one of the hands of Pernida, but it’s quickly for naught as Pernida recovers. Pernida uses his nerves to infiltrate Nemu’s body and destroys her completely. 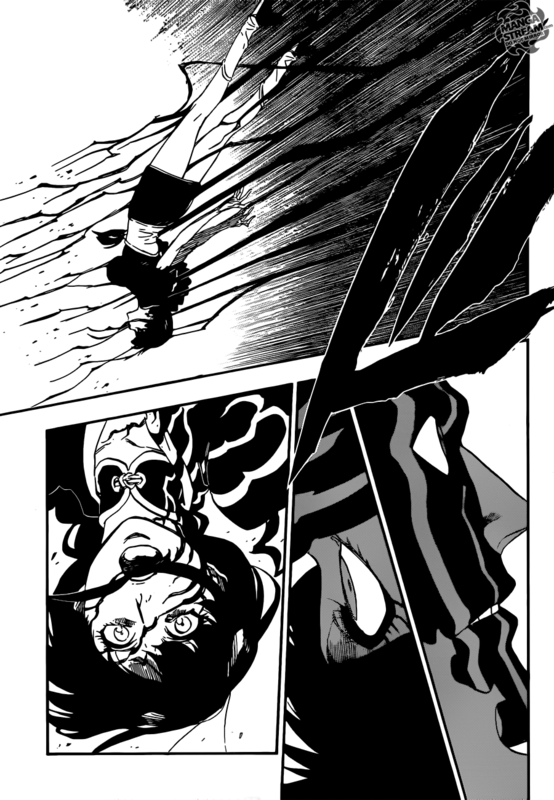 Mayuri shows some sign of emotion as Nemu is killed. 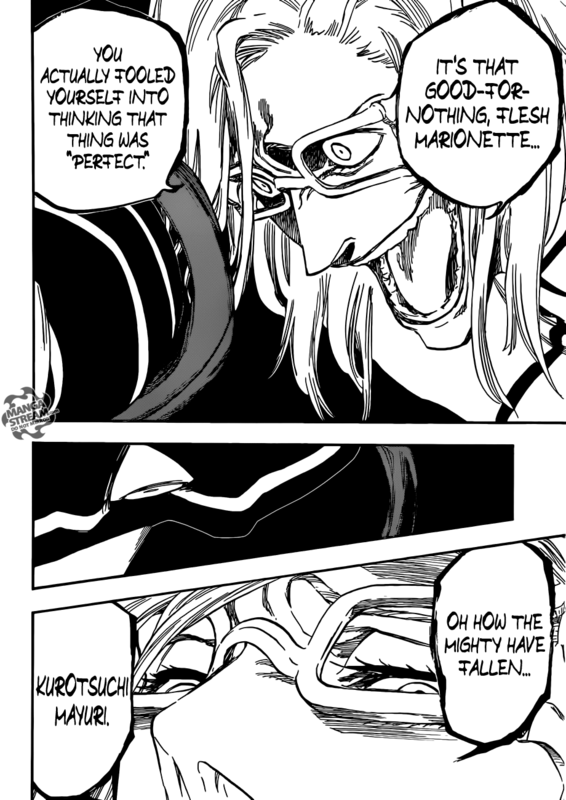 Szayelaporro Granz appears to mock Mayuri for showing emotion. It’s unclear (at least to me) whether Granz was “real” or symbolic. My confusion is whether he actually is taking to Mayuri or Mayuri is losing his mind. Regardless, Mayuri crudely allows Pernida to “lap up” what was left of Nemu. However, he keeps her cerebrum. Pernida attacks with it’s nerves but Mayuri blocks with his Reiatsu. Mayuri implies that Pernida will die as a result of his consumption of Nemu. Pernida begins to expand, as Mayuri explains “how he replaced Nemu’s regenerative cells with cells that multiply at high speeds and reveals they are controlled by the brain alone before revealing that the clone will die from excess regeneration as the clone’s tissue is grossly expanded“. The death of Nemu wasn’t a surprise, but the quickness of it was. To be honest, I don’t really care about Nemu so I’m not at all of sad that she’s dead. Also, Mayuri will just create another version later. The battle between Pernida and Mayuri has been interesting. 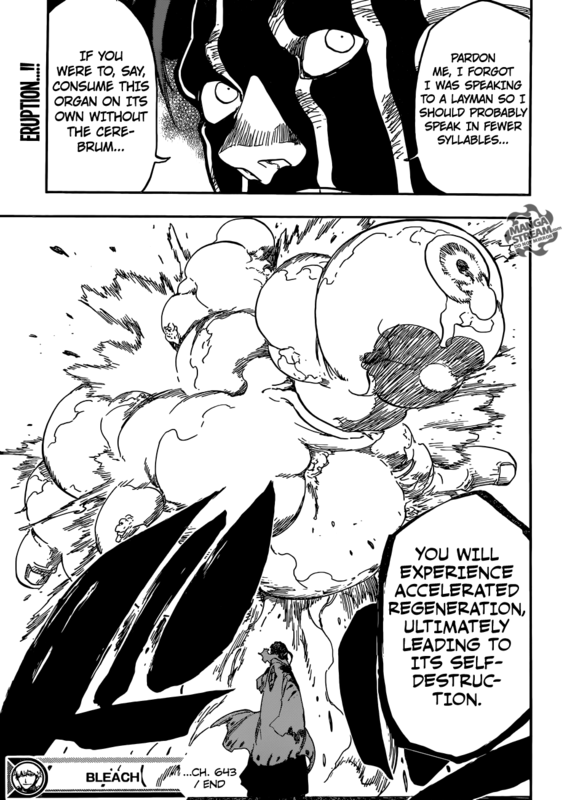 Like all of Mayuri’s battle’s it’s not just about power over power, but intelligence with planning. This fight seems like it will end in Mayuri’s favor, but it was fun while it lasted. Yeah… hmmm, I agree with you that Nemu’s death was not only unexpected, but wasted, but I’m not sure I feel like this fight was particularly interesting. Mayuri’s science is always, like in this fight, presented after the fact. Like, surprise! science has thwarted you all along. So, I rarely FEEL his intelligence, especially since he constantly TELLS us how smart he is. For my money, I would have liked to linger, a few chapters back, on his technique that mimics the Quincy flashstep-thingie, because I feel like the story that is missing with Mayuri is the fact that he’s personally responsible for the torture of the “last” of the Quincies, or at least that was what was implied in his original battle with Ishida. I wish the Quincies would bring that up, because it’s one of the things that makes their fight make sense. Ah, sorry for the rant. Good chapter review! Thank you. I would agree that Mayuri seems to ALWAYS have all the answers when it comes to his battles. However, in this battle I think something has changed. He was caught off guard, by Pernida’s abilities.His new Bankai quickly was defeated and he needed to be saved by Nemu. Mayuri has always had abilities that are unexplained and as a consequence it appears like he always had the correct remedy. I think his intelligence is best displayed when he analyzed​ his opponents abilities. Hiya! I am seeking for Manga/Anime bloggers which lead me to your blog. I couldn’t find your email address, can you kindly shoot me an e-mail: alysonburston[at]live.com — It is regarding writing about Manga/Anime type of offer. This isn’t spam btw. Thanks. Hiya! I’m looking for Anime and Manga bloggers and found your blog. I could not find your email here, can you kindly send me an email: alysonburston[at]live.com — It is regarding writing about Manga and Anime type of offer. This isn’t spam btw. Cheers.